I am writing this after working a long and frustrating shift on Black Friday, a day that used to be kind of fun to participate in, but has now turned into an on actual Thanksgiving shopping day! People leave their families to go shopping! If I used internet acronyms, I’d say “SMH” right now, and yes, I work in a mall, so yes, I am a little biased here, but don’t worry. I have the perfect thing to discuss right now. 1. Make sure your shoes aren’t too tight. And that your head is screwed on. And that your heart isn’t two sizes too small. When we first meet The Grinch, the narrator / Dr. Seuss if you are reading the book goes through the list of reasons that the protagonist is such a jerk. I love this small list of reasons because we immediately assume that there is a purpose behind The Grinch’s grinchiness. There are no bad people (or…Muppet-like creatures? ), there are only relatively uncomfortable things that make a person grouchy. I think my shoes are on too tight quite often, if you catch my drift. Oh, and if all of those things check out, then you are most likely not a Grinch. 2. Too much noise is really irritating. The Grinch hates Whoville because they are always eating delicious food, and making too much noise, and SINGING. But at least in the movie version while The Grinch is discussing the squeals of the trains, and the jing-tinglers, and the tar-tinklers, and the gardinkers, and the tromtookers, and slum-slookers, and man…that is pretty annoying, you guys. I ain’t even mad at Grinch for all that. 3. Singing is never a bad thing! Like Buddy the Elf taught us, and like the story of The Grinch proves, singing is never bad. I know it is really annoying to some people, but I never find singing to be obnoxious, and I have been serenaded by a barbershop quartet singer plenty of times so I think I would know. Why do you think I love Glee so much? Because singing is the best. Music is a cure-all. Nothing can happen in your life that a song cannot help you through. Don’t argue with me. Christmas music is beautiful, even too early, or a little too late. 4. How to turn a dog into a reindeer. 5. Don’t steal Christmas, obviously. Well even though The Grinch learns an awesome lesson from this whole experience of taking Christmas…I would still advise against it. Remember what happens to Bart Simpson when he burns the presents accidentally and then blames a fabricated burglar? I mean…not a whole lot happens except for everyone gets super mad at the Simpson family, but what else is new? Total tangent, but the reason I chug water before going to bed is because Bart does it in this episode so that he wakes up early. It works for me! I have never, ever slept through an alarm. And I used to be a barista! 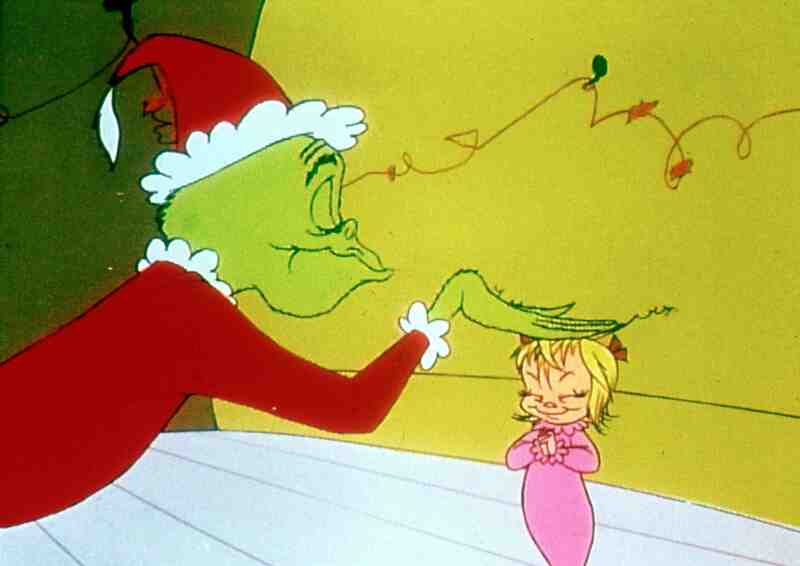 What the heck is up with Cindy Lou Who mistaking The Grinch for Santa Claus? I mean, he’s skinny, and green, and he is literally robbing her family. I know kids tend to be innocent minded, but come on, little girl. She also accepts a drink from The Grinch, so like…the Lou Who parents need to teach her a thing or two about trust. 7. Christmas will always come, no matter what. Now we are getting to the corny stuff. After The Grinch jacks everyone’s homes of everything–presents and food and decorations–he awaits the sound of sadness that will inevitably come from Whoville. Of course, he is shocked when all he hears is that lovely Christmas singing. Because guess what? No one can take away Christmas! That’s right, Mom! We never believed your empty threats! 8. Even the smallest old heart can grow. Classic Christmas formula. It happens to everyone in Christmas stories: Ebenezer Scrooge, The Grinch (obvi), Walter in Elf, pointed head Neil from The Santa Clause…I mean, the list goes on and on. And the best part of Christmas is that everyone comes together at the end of the movie. That’s right, at the end of the movie. Cause in real life, I’m not so sure that all Grinches turn into Christmas lovers by the end of a story. 9. Christmas is a feeling, not a thing. So anyway, as The Grinch discovers after stealing (what he believes to be) the joy and holiday spirit out of Whoville, Christmas is not about presents and rich foods and decorations. Christmas is not about anything except love for family and friends. Christmas is just about being grateful and thankful and blessed, like most of us are. I hate to be corny (no I don’t, actually), but I have always loved Christmas not for the presents, but for the feeling. I used to love falling asleep to my Christmas albums (On a record player! Because we were poor, not because it was cool. This was the 90s.) and observing the glow of the lights from the tree through the bottom of my bedroom door. It made me feel so warm and fuzzy, and presents never mattered all that much. I like hanging out with my brothers and making them play games they hate, and watching movies that only I enjoy, and sure, I guess Christmas is a selfish holiday for me, but only because my brothers don’t like Christmas stuff. But they put up with me well, and I have never had a really bad Christmas. Material items don’t matter to me at all–it is all about quality time with the ones you love. Awwwwwwwwwwwww. And that’s all coming from a Leo, so you have to agree with me! …but I still want an iPad really, really bad. Sigh. Merry Christmas, you guys. Soak up the season. Oh, wait! I forgot my last lesson. 10. The Grinch should stay animated. Featured image via , Cindy Lou Who image via boston.com, Jim Carrey image via drafthouse.